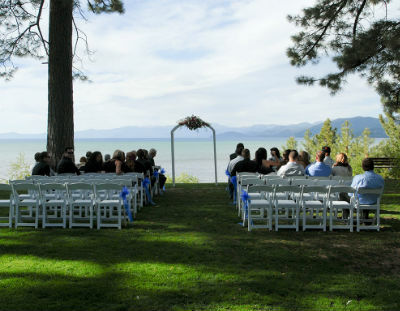 Regan Beach provides a year round wedding location in South Lake Tahoe, California. This ceremony location is centrally located and easy to reach for you and your wedding guests. With one of the most romantic settings that the lake has to offer it is the perfect spot for stunning sunset photos. Regan Beach Park is located on the west end of El Dorado Beach in South Lake Tahoe. With a lush grassy park above a sandy beach there are breathtaking views of the crystal blue waters of Lake Tahoe. The park is home to old growth Jeffry Pine trees that are over 100 years old, imagine being married under the shelter of some of Lake Tahoe’s grandest trees with the brilliant blue lake as your backdrop. Regan Park West is leased by the city of South Lake Tahoe for a fee (call for current fee schedule) for a two hour wedding time slot. Regan Beach Park has a capacity of 80 wedding guests. There is ample Parking and handicapped access. Chairs, arches and runners can be rented if needed. Your outdoor Regan Park wedding includes license service, professional wedding photography, professional minister, beautiful bridal bouquet and grooms boutonniere. Nestled off to past the park’s exit you’ll find this beautiful grassy knoll overlooking the lake. There are stairs leaving the grass heading right down to the beach. The park itself has a huge grassy field, playground, volleyball. Reagan Beach is operated by the City of South Lake Tahoe.